Carl Froch(31-2,22ko’s), Britain’s pound for pound number one is currently riding the crest of a wave. His win over Mikkel Kessler(46-3,35ko’s) catapulted him into the general public’s attention and has solidified him as being one of Britain’s greatest and most entertaining fighters. Had Froch had the publicity earlier on in his career as Amir Khan had and the likes of Luke Campbell and Anthony Joshua are now obtaining, who knows how much of a star the Nottingham man may have become. As it is however, Carl has finally reached the top and is now bankable box office draw. The question is though, is Carl Froch, and can he ever become, a modern day great. In years to come will he be remembered as fondly as the likes of Eubank, Benn, Lewis, Hatton and Calzaghe. When comparing Carl Froch’s record to others it is incredibly difficult in my mind to not place him in the upper echelons of British boxing history. Amongst his 31 wins and 2 defeats, he has done it all. In only his 10th fight, Froch stopped Alan Page in 7 rounds to pick up the English Super Middleweight title. Only four fights later he had picked up both the Commonwealth British titles. He successfully went on to defend both titles and won the Lonsdale belt outright in stopping Tony Dodson and brought his record to 20-0. After impressive wins over Robin Reid and Albert Rybacki, he then challenged Jean Pascal(27-2-1,16ko’s) for the vacant WBC title. This would indicate that Froch slowly progressed through the proper avenues of developing a fighter whilst learning the trade, before eventually challenging the worlds best. Unlike many top fighters, Froch delivers for the fans time and time again. His run of ten consecutive world title fights have yielded great spectacles on most occasions. Many readers have likely not viewed the scrap between Froch and Jean pascal. A frantic pace throughout set by both fighters created a tremendous contest which eventually lead to Froch winning a unanimous decision. Unlike many ‘world champions’ that pick up their first world title against lesser opponents such as Nathan Cleverly picking up the WBO light heavyweight belt against Aleksy Kuziemski…….. The Cobra fought an elite fighter in Pascal who has since went on to beat Chad Dawson and draw with Bernard Hopkins. Carl then defended his strap in Connecticut versus Jermain Taylor(31-4-1,19ko’s), a former undisputed middleweight champion. In another enthralling fight Froch was knocked down in the 3rd round but came back to stop Taylor with only 14 seconds left in the 12th round. This proves that he is a genuine world level fighter that could also get the job done away from home. A controversial win came next over previously unbeaten Andre Dirrel(20-1,14ko’s) in which many believed Dirrel had done enough to win the fight. As it is however Carl remained undefeated then fought Mikkel Kessler for the first time. This was to be his 3rd excellent fight at world level in which he eventually lost a close decision in Denmark that was a contender for 2010 fight of the year. Becoming a two time champion with a dominant win over Arthur Abraham and then defending his title in the semi final of the Super Six versus Glen Johnson, Froch continued to be one of the best fighters at Super Middleweight. His defeat against pound for pound number 2 in the world, Andre Ward(26-0,14ko’s), was possibly one of the lowest points in Froch’s career and is one of the only times he has not delivered on the big stage. Since that poor night, Froch has proved critics wrong in firmly pushing himself back to the top of the world scene. A dominant win over previously unbeaten Lucian Bute(31-1,24ko’s) for IBF strap, propelled Carl to stardom as yet again he put on a great show for all watching. An easy defence against Yusaf Mack was followed by his biggest night so far, a rematch with Kessler. It brought about the return of Sky Box Office after multiple woeful David Haye fights and brought Carl Froch eventually to the mainstream sports fan. A fantastic fight followed with both men hurting one another. After 12 rounds all three judges viewed Froch the unanimous victor. Carl Froch is a four time world champion and current holder of both the WBA and IBF straps. He is the most talked about fighter in the division and is the definite money maker at the weight. His run of hard fights can not be matched by anyone and not many can claim to have been as exciting as he has. At this moment I see Froch very close if not on par with Joe Calzaghe. It looks as if Froch will be forced to fight the mandatory challenger for the IBF belt in George Groves next. Although I think Carl will ultimately win, it should shape up to be another enthralling contest. After that if Matchroom were able to make Froch vs Kessler 3, which would be another huge box office event, it could propel the Cobra to even new heights. Then finally a showdown with Andre Ward in the UK would ultimately decide whether he is remembered as a great. A win over Ward would avenge the other defeat on his record. 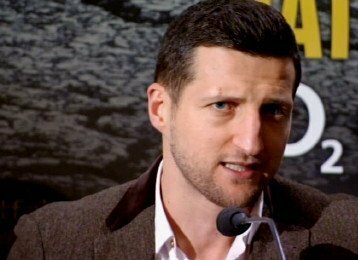 It would also put Froch as the undoubted number one in the division. If he is able to do so there could be no argument, and Froch must be labelled a great. The next 18 months to 2 years, could just be, Epic. You are here: Home / Boxing News / Carl Froch, A modern day great?